Teaching children about money and budgeting are some of the most difficult lessons for me to teach them. Not only are these topics extremely diverse and complex, but children are fairly impetuous creatures and want everything right away. Seeing down the road into the future is also a very difficult concept for them to grasp, since their idea of the future is what is for dinner that night. Even with these obstacles in our way, as parents, there are still a few ways to make teaching them the concept of budgeting easier. As with every lesson we teach our children, starting with the basics is the best way to begin. Children’s brains process information differently than adults do. So, if we want anything to have long lasting power for them, the information needs to be more simplistic and broken down into smaller chunks. Starting children out with a simple piggy bank (although it doesn’t have to be an actual pig!) is one of the easiest first steps to implement. Since children are very visual learners, this gives them something to physically see and touch to begin the teaching process. They can put every little bit of change they receive, or find, into it. Once they have that down, next on the list is to teach them how much things REALLY cost. This requires knowing what the tax rates are in your city and state so that you can teach them how to calculate the sales tax. A good way to do this is to take them shopping with you and have them pick out something they want. This doesn’t mean you are planning to buy this item (let’s say a pink flamingo pool float, for arguments sake), but you want it for educational purposes. Let’s say your child has $10.00 with them and sees that the pink flamingo pool float costs $9.99. Most children automatically assume they have enough money to buy the toy. But, they don’t understand about sales tax yet. This is where you, in all of your infinite financial wisdom, come in! The sales tax where we are is 7.25%. If we whip out a calculator and do the math with them in the store, they will quickly see that they cannot afford the flamingo pool float just yet. This is because that $9.99 price tag, really becomes $10.71 when we include tax. They still need another $.71 in order to get this pool float. Now, if you happen to live in one of the few states that don’t have a sales tax (GO YOU! ), then this lesson doesn’t apply as heavily. But, it should still be taught, in case they ever travel anywhere outside of your home base, which they probably will. Once they understand how much they actually need to purchase the thing they want, then they need to learn how to save. Saving can be a very difficult thing for a lot of children, because they want everything RIGHT NOW. Starting with smaller goals for saving can help keep them on track for their larger goals. I have found that the visual aspect of keeping physical money in a piggy bank helps them see just how far they have come. Having them take out all of their money once a week and count it, is another good way to assist them with seeing just how much further they have to go until their goal is reached. This usually lights a fire under their butts to earn more money that week so they can finally buy the thing they have been eyeballing. Seeing and touching money is a great motivating factor for kids! Once they have this basic saving skill grasped, then it’s a good idea to move on to teaching them how to budget for even bigger things. Some of these bigger things could be a car, college, a 2-year trek around the world, retirement, etc. These are not small items and they usually come with much larger price tags than that pink flamingo pool float we were using as an example. This is the point where the piggy bank is no longer the best method for saving. In order to save for these bigger items, they need to move their money to a high yield savings account. The rates vary, but they will be able to save more, faster, simply due to the magic of compounding. Here is a great example of how compounding works with $100.00. If this is all they have to put in and the high yield savings rate is 2.4%, then at the end of one year they will have $102.43 in that account. This may not sound like much, but they just made an extra $2.43 without doing anything. Imagine what they could do if they invested this money in something like Stockpile instead and got the average 7% rate of return! Now that they are really motivated to earn more money, getting them to work for it is the next step. Getting children to do chores around the house can be a difficult task sometimes, depending upon the child. But, when they have the motivating factor of a thing they want, they have a tendency to be much more excited to do chores. I like to give the children a list of ALL the things that need to be done, both inside and outside the house. Then they each write down the chores they would prefer to do and how much they think each job is worth. Now, this is the interesting, and fun, part! What I, as the adult, and what they, as the children, think the chores are worth are usually very different numbers. So we usually end up in a little bit of negotiation to come to a more realistic number. This is not only teaching children about working for money, but also just how much things are worth in today’s economy. So I wouldn’t suggest paying your children much more, if anything, than what the current market rate is for certain basic chores. But learning the art of negotiation, and what they think their time is worth, are important life lessons. Once they have these down, you can move on to more complicated financial lessons. 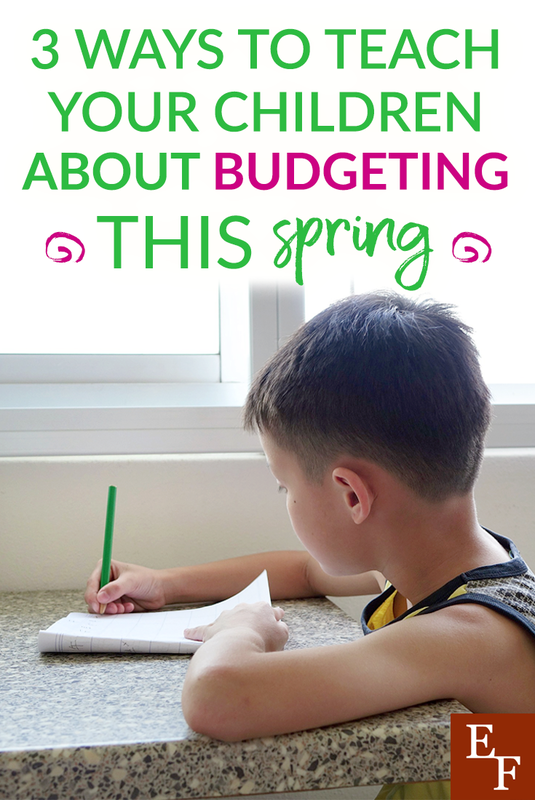 What are some ways you have successfully taught your children about budgeting and money?